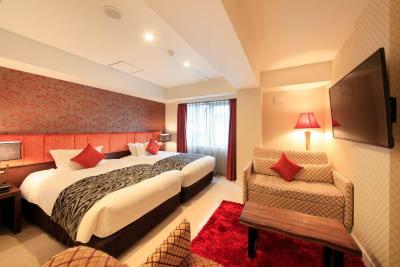 Lock in a great price for Centurion Hotel Grand Akasakamitsuke Station – rated 8 by recent guests! I chose this hotel as it was centrally located and could fit our family of 4 with 2 adult size teenagers (hard to find in Japan!). The staff were very friendly and breakfast is excellent! Its only 2 walks to the metro station so convenient. 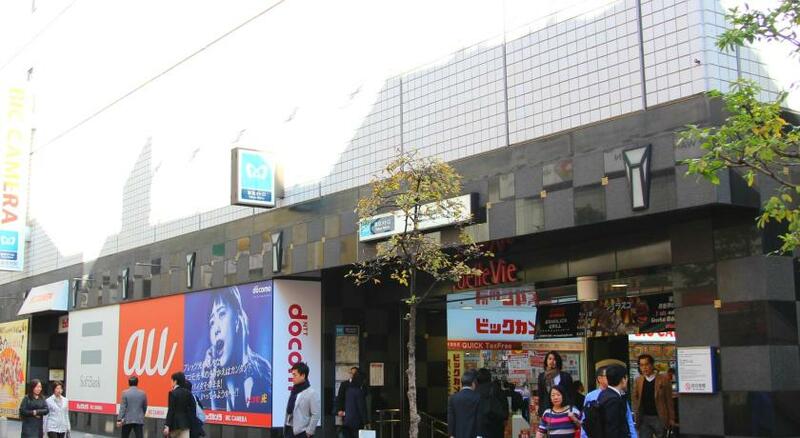 The location was great; Akasaka and Akasaka-Mitsuke stations are both within 5-10 min walking distance, LOTS of places to eat (besides Japanese, there's also Italian, Spanish and even Subway, Wendy's & McDonald's), convenient stores like Family Mart, Lawsons, 7-11 and Don Quijote are close by, as well as a post office and ¥100 shop "Can Do". There are also hair salons, places for massages, a market and theatre. 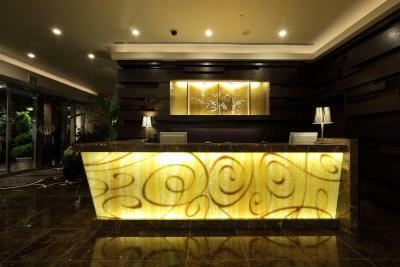 Though the rooms are smaller than American style hotels, you can't beat the location and friendliness of the staff. 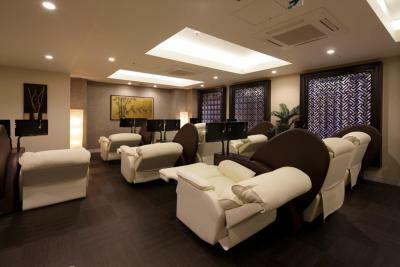 Other pluses is being able to use the nearby onsen spa at the "Centurion Hotel Spa Ladies" for women, or for the men, the onsite onsen & being able to store your luggage after check-out. There are 3 coin-operated laundry machines (¥200 for wash, ¥100 for dry) available 24/7 as well as a microwave and vending machines. Good location if your visiting Japan for the first time. Plenty of restaurant and drinking choices around as it's a salary man's after work haunt but at the same time a lot of foreign tourists so you lose a bit of the "living with the locals" atmosphere. Very convenient subway line with both the Ginza and Marunoichi lines as well as a couple more 10min away. Good public bath which is mens only as a lot of salary-man come after work. 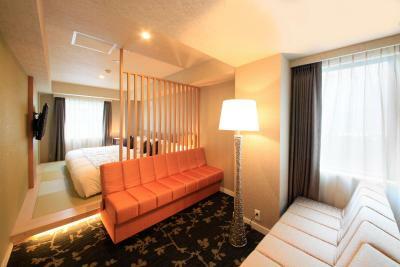 I like the location, comfort & cleanliness of the rooms and the Japanese style breakfast. Beds were very comfortable. Hotel was in a great location very close to metro. Room size for moderate twin in annex were plenty big. Lovely lotions and potions in the bathroom. Location is great- close to subway station, stores, starbucks( coffee shops), restaurants. Free WiFi and free spa. The family room has an attached bathtub the surpassed our expectation. Though the space is limited but we are very happy with the room. They have laundry for only ¥200 and dryer for ¥100. The bathroom of our room was impeccably clean. Quiet area, lots of good food around. A few stops away from the busy Shibuya and Shinjuku. One line going to Disney. 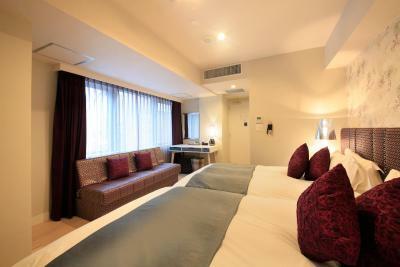 Centurion Hotel Grand Akasakamitsuke Station This rating is a reflection of how the property compares to the industry standard when it comes to price, facilities and services available. It's based on a self-evaluation by the property. Use this rating to help choose your stay! 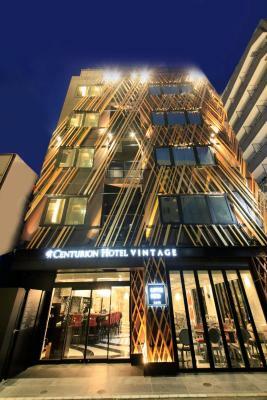 One of our top picks in Tokyo.Centurion Hotel Grand Akasaka is a convenient 3-minute walk from Akasaka Subway Station and a 2-minute walk from Akasakamitsuke Subway Station. Free Wi-Fi is available throughout the property. Carpeted designer rooms feature a flat-screen TV, a Slumberland mattress, air conditioning/heating and an private bathroom. Each comes with a refrigerator and an electric kettle. 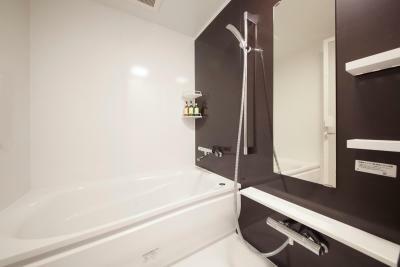 In addition, free organic amenities including shampoo, conditioner and body wash, as well as a hairdryer can be found in rooms. A Japanese-style breakfast buffet is available at the dining area. 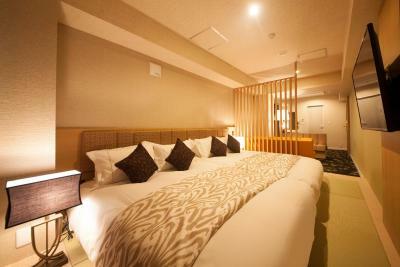 The Imperial Palace is a 12-minute walk and train ride away. The fancy shopping district of Ginza is a quick 10-minute train ride and walk away, while Tsukiji Market is a 15-minute taxi ride away. 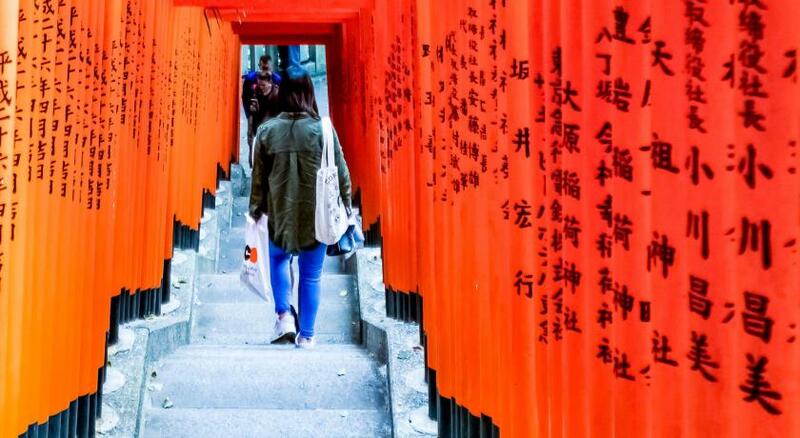 Minato is a great choice for travelers interested in friendly locals, cleanliness and culture. 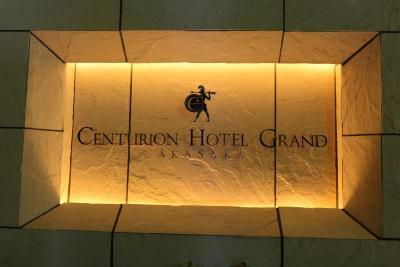 When would you like to stay at Centurion Hotel Grand Akasakamitsuke Station? Carpeted designer rooms feature a flat-screen TV, air conditioning/heating and an private bathroom. Each comes with a refrigerator and an electric kettle. In addition, free toiletries and a hairdryer can be found in rooms. This room is located in the main building. 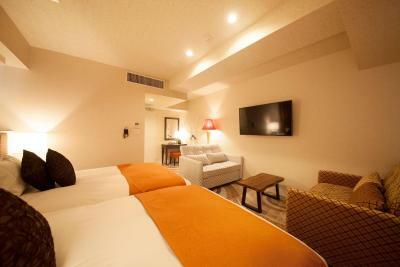 These larger, carpeted designer rooms feature a flat-screen TV, air conditioning/heating and an private bathroom. Each comes with a refrigerator and an electric kettle. In addition, free toiletries and a hairdryer can be found in rooms. An extra single bed will be prepared for the 3rd guest. These larger, carpeted designer rooms feature a flat-screen TV, air conditioning/heating and an private bathroom. Each comes with a refrigerator and an electric kettle. In addition, free toiletries and a hairdryer can be found in rooms. An extra single bed will be prepared for the 3rd guest. These spacious, carpeted designer rooms feature a flat-screen TV, air conditioning/heating and an private bathroom, containing a jet bath. Each comes with a refrigerator and an electric kettle. In addition, free toiletries and a hairdryer can be found in rooms. 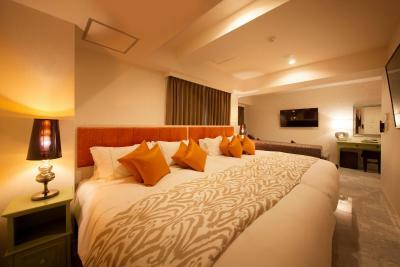 These carpeted designer rooms feature a flat-screen TV, air conditioning/heating and an private bathroom. Each comes with a refrigerator and an electric kettle. In addition, free toiletries and a hairdryer can be found in rooms. This room is barrier free. Carpeted designer rooms feature a flat-screen TV, air conditioning/heating and an private bathroom. Each comes with a refrigerator and an electric kettle. In addition, free toiletries and a hairdryer can be found in rooms. Features a semi-double bed (47 in wide). 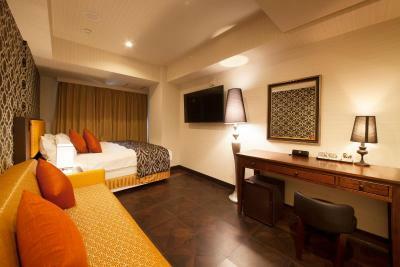 These more spacious, carpeted designer rooms feature a flat-screen TV, air conditioning/heating and an private bathroom. Each comes with a refrigerator and an electric kettle. In addition, free toiletries and a hairdryer can be found in rooms. An extra bed will be prepared for a 3rd guest, only when the booking is made for 3 guests. Please indicate the correct number of guests at time of booking. This double room has air conditioning, electric kettle and sofa. 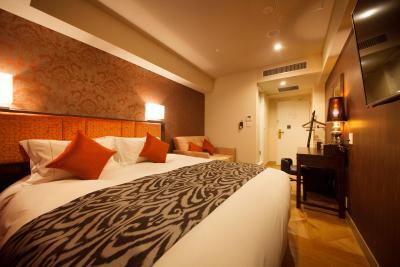 This double room features air conditioning, flat-screen TV and sofa. This triple room has a electric kettle, satellite TV and air conditioning. Please note, this room is located in the annex building but guests are required to check-in at the main building. 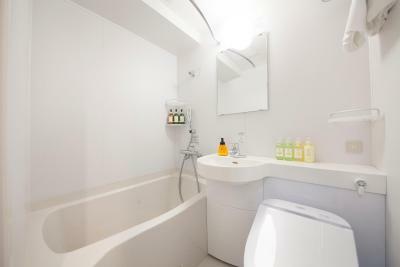 This triple room features air conditioning and electric kettle. This quadruple room has a flat-screen TV, electric kettle and air conditioning. This family room features air conditioning, electric kettle and satellite TV. An extra bed will be prepared for a 5th guest, only when the booking is made for 5 guests. Please indicate the correct number of guests at time of booking. Hotel surroundings – This neighborhood is a great choice for travelers interested in friendly locals, cleanliness and culture – Check location Great location - show map Guests loved walking around the neighborhood! 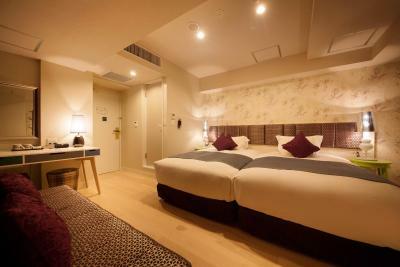 House Rules Centurion Hotel Grand Akasakamitsuke Station takes special requests – add in the next step! Centurion Hotel Grand Akasakamitsuke Station accepts these cards and reserves the right to temporarily hold an amount prior to arrival. Guests arriving after 23:00 must inform the property in advance. If the property is not informed, the booking may be treated as a no show. Contact details can be found on the booking confirmation. The property will contact guests who booked 3 rooms or more. The full deposit needs to be paid to the property at least 1 week before the arrival date in order to secure the booking. The booking may be cancelled if guests fail to respond to the communication or if they cannot pay the deposit. If the booking is made within 1 week of the stay, the payment method can be negotiated. Please note that the hotel will undergo a scheduled power outage due to facility inspections and electric facilities including WiFi, air conditioning, lifts and hot water supply will be out of service on the following dates/times: 20 May 2019, 03:00-04:00 in the morning. Like in other Centurion hotels sometimes you have to go for breakfast to the restaurant near by. In Grant Akasakamitsuke is like that as well. 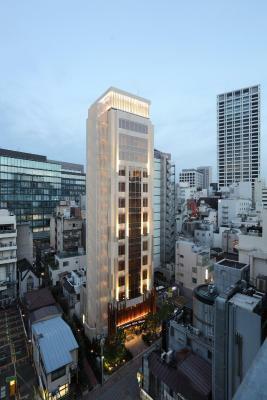 In general it is not a problem (but I do not know how it would be during winter…since newer was in Japan during winter time), but in this case the breakfast restaurant is planned for guests from two hotels and is quite small one. We always had to wait 5-10 minutes, especially that we were in group of 6, for the available table. Once again, it is not a problem, and everything is done in a very pleased way, but I can imagine that some people could be not happy with this. Everything was OK, of course rooms were extremely small but this is standard in Japan and we did not claim, since we did not expect it to be different. We stayed with two kids in the room with additional sofa, which was quite narrow, but we could manage. The hair drier was bit broken, but also with this we managed. 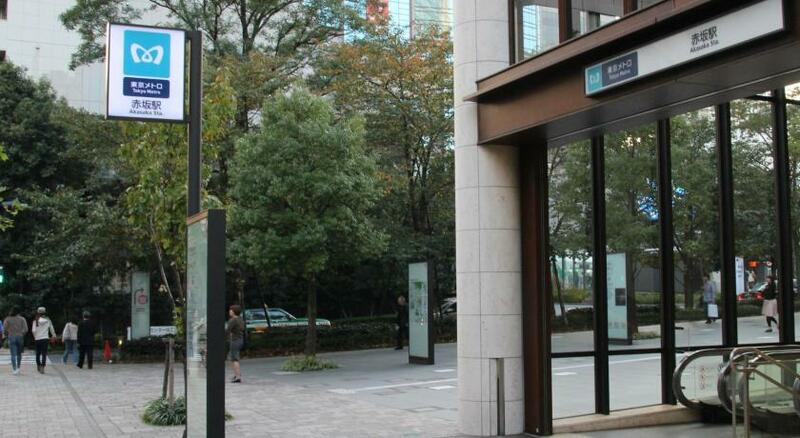 The area and localization is perfect for us, it was our third stay in Tokyo and we chose this hotel since we wanted to be at Akasaka Mitsuke. Room was small but this is ok for city center budget hotel. Queues for breakfast - need to get down there early. 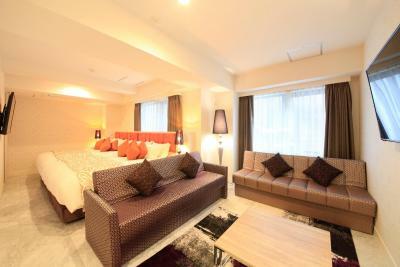 Very satisfactory as base for exploring Tokyo - within walking distance of Imperial Palace and well located for metro. Good selection at breakfast. It was my worst staying in Japan. FYI, I visited Japan more than 20 times. Here are the reasons below. 1. Even though I booked a double room, there was a very small bed like a single bed. BUT, I thought that 'This is Japan. It can be because the room and bed are usually very small.' But when I saw one towel in the morning, I was convinced that these people made a mistake. 2. I made a special note when booking and received a reply from the hotel. BUT, nothing happened! 3. The pillow condition was bad and no soundproofing at all. The room was so small for 3 people. It was even hard to move around. And the wifi at the room was very very slow. Location. Close to metro station. Lots of restaurants in the neighborhood. Very clean and comfortable little room. Breakfast was small but delicious. Service is excellent! Extremely dirty! Floors were dirty and had dust balls all over the room which means it hadn’t been cleaned properly in a long time! The rooms are EXTREMELY small we had a double bed and very uncomfortable sofa bed and there was no other room! Not even for our cases! Not suitable for 3 guests! Room service came in, changed the towels, never the bed sheets in 5 days and cleaned 2 of the three mugs ... left the 3rd one there and dirty! The staff. A particular staff at reception was just blatantly rude and inattentive. Never thought I’d receive such poor service in Japan. I was standing there waiting to be served next in line and she just kept on ignoring me until I physically had to wave at her to serve me. The housekeeping was the worst I’ve ever experienced, lazy and inattentive staff! They’ll leave towels and your clothes on the dressing table and cups unwashed. The service definitely did not meet any expectations! 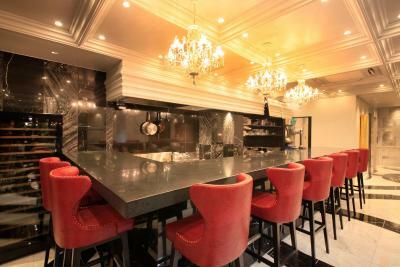 The location was tops, close to the metro and restaurants. A big seller for us was the self serve coin laundry, cheap and easy to use! Always wishful thinking in Japan to have more room. Was hard to open all 4 suitcases.